River facing Swiss tents or tourist guest house with beds, beach volleyball, parachute conference area, bonfire and bar-be-cue, tug of war, Frisbee, kids recreational area. River rafting, treks, nature and wildlife exploring, expeditions, quiet solace seeking retreat. It comprises of 16 Kms. stretch of river rafting from Shivpuri to Rishikesh. Lunch at the beautiful beach assured of. 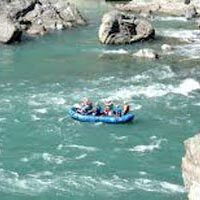 It is mainly for those who want to have a thrilling experience of rafting within a short span of time amongst those glorious spectacular sights, which no amount of leisure could afford.